As I was making the list of 15, including the honorable mentions, I realized that four of the moments came against the Reds. This moment is one of the early turning points of the season. 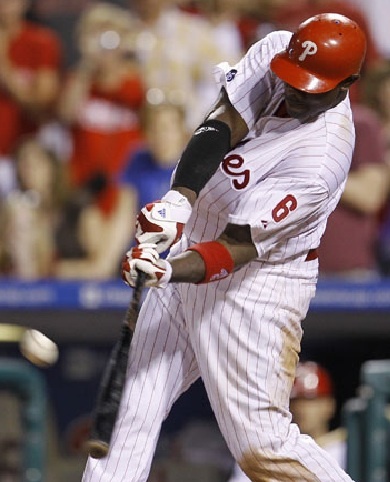 Slugger Ryan Howard hits the two-run walk-off homer in the 10th inning. Heading into the All-Star break, the Phillies were struggling with health and the bats. The game prior to this, Brian Schneider hit a walk-off homer in the 12th. But with the Phillies trailing 7-1 in the bottom of the ninth, a win didn’t seem evident. Shane Victorino led off the inning with a double to right. Raul Ibanez then flew out and Victorino scooted to third. Ryan Howard followed up with an RBI single to make it a 7-2 ball game. Jayson Werth then singled and Greg Dobbs, who pretty much disappeared all season, hit a three-run home run off the foul pole to make it a 7-5 game. But Cincy got the second out of the inning right away with a fly out by Brian Schneider. The pinch-hitter Cody Ransom hit a two-run homer to right-center, tying the game up and completing the six-run ninth-inning rally. Howard then finished the come back, hitting a two-run homer in the bottom of the 10th, knocking off the Reds, 9-7, in typical Phillies fashion. Previous 2010 Moment: #5 Now batting, left fielder… Roy Oswalt!